We are a healing presence to others when we give them strength and when we give them hope. On Becoming a Healing Presence, Dr. Albert Rossi explains how to do both in imitation of Christ, our complete healer, who desires nothing more than for us to be His humanity on earth—his healing presence to others. 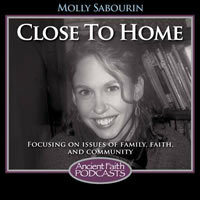 Molly Sabourin is a freelance writer focusing on issues of family, faith, and community. She is also an Orthodox Christian, a wife, and a frenzied mother of four. Read more of her reflections at her Close to Home blog. 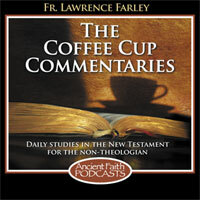 The Coffee Cup Commentary series provides daily (Mon-Fri) studies in the New Testament as taken from The Orthodox Bible Study Companion Series published by Conciliar Press. Enjoy the Coffee Cup Commentaries with your new AFR coffee mug! Available in black or blue - click on the image below for more information! “From My Youth” is a monthly, interview-based podcast. 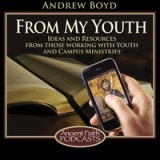 Each month, Andrew Boyd welcomes a new guest to provide resources for those working in youth, young adult, and campus ministry. The podcast will focus on practical ideas and information that will help people “in the field.” From experienced youth and campus ministry leaders sharing their experiences to psychologists offering advice and guidance on identifying and helping depression, a variety of useful skills will be showcased. 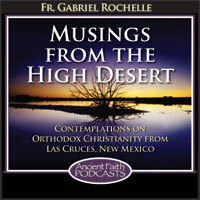 This podcast will help equip clergy and lay people for ministry to youth and young adults. Padre Antonio Perdomo comparte las lecturas bíblicas diarias y las vidas de los santos en español. Escuchar todos los días! Padre Antonio Perdomo shares the daily scripture readings and the lives of the saints in Spanish. Listen seven days a week! 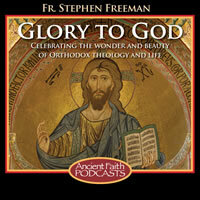 His weblog “Glory to God for all Things,” has quickly become one of the most read Orthodox sites on the Web, being translated frequently in Romanian, French and Serbian, by enthusiastic readers. He is also author of the Conciliar Press book Everywhere Present. 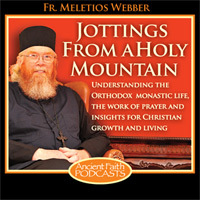 Understanding the Orthodox monastic life, the work of prayer, and insights for Christian growth and living. “Lord Send Me!” is named for that beautiful passage in the Prophecy of Isaiah, Chapter 6, wherein, when asked by the Lord, “Whom shall I send, and who will go for us?”, the Prophet replies, “Here am I, send me!”. In the podcast Send Me! Fr John Parker shares his thoughts and reflections on Evangelization—sharing the Good News—in North America. He encourages all listeners to share Isaiah’s bold humility to bear witness to the work of the One True God in their lives in word and in deed. Join Fr. 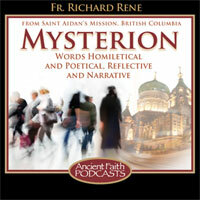 Richard Rene and the parish of St. Aidan’s in Cranbrook, British Columbia, for words homiletical and poetical, reflective and narrative. Come and explore the challenges of the spiritual life at the intersection of the eternal Gospel and the 21st century.